Hundreds of Iranian Kurds are bolstering Kurdish forces in Syria and Iraq as volunteers in the fight against the Islamic State, according to fighters and Kurdish sources in Iraq and Syria. “I decided to come to Syria to help my Kurdish brethren fight (IS),” said Iranian Kurd Zanyar Rafaat, who joined the Syrian Kurdish People’s Protection Unit (YPG) after IS began a major onslaught on a Kurdish enclave in northern Syria in 2014. Rafaat, 27, still fights with YPG to combat what he calls “Kurdish oppression” by the Islamic State. Thousands of volunteers from many nations – among them, Americans and Europeans — have been supplementing Kurdish forces over the past two years. Kurds train them, provide weapons and house and feed these volunteers. Several of them, including an American from Maryland, have died in battle. The Iranian Kurds are choosing to volunteer, working outside Iran's official military involvement in the region. 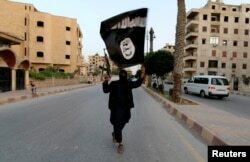 A member of the Islamic State carries the militant group's signature black flag in Raqqa, Syria in 2014. With some 8,000 elite troops in Syria, and thousands more fighters from its proxy Hezbollah, Iran has played a key military role in Syria’s civil war in support of Syria, mostly against anti-government rebels. Iran also helps Iraqi forces fight against IS with training and weapons. Ethnic Kurds make up nearly nine percent of Iran’s population of 80 million people. They are largely Sunni Muslims and have long desired more autonomy from Tehran's firm grip, calling for cultural and political rights. Iran has fought Kurdish rebels seeking regional autonomy for years. “Iran allows those young Kurds to take up arms as long as this does not pose any threat to its national security,” explained Arash Saleh, a Kurdish affairs analyst in Washington. A militiaman from the Kurdistan Freedom Party, an Iranian Kurdish opposition group, stands behind his truck-mounted machine gun on a section of the frontline near the Iraqi city of Kirkuk on Sept. 5, 2016. Iranian Kurdish fighters say they generally cross porous borders into Iraq with the intent of joining Kurdish units. Some of them travel to Syria to join Kurdish forces there. Kurdish commanders reached by VOA in Syria declined to comment on the volunteers, saying the subject was a sensitive one. Sources close to the YPG confirmed that Iranian Kurdish fighters have been fighting with the Syrian Kurdish group since 2014, and are actively recruited. An Iranian Kurdish rebel group has reportedly received military training from U.S. and European advisers as part of the international program backing Iraqi Kurds against IS, the group's commander told The Associated Press (AP) recently. The United States has backed Syrian and Iraqi Kurdish forces against IS fighters since 2014. In addition to air support, the Obama administration has also provided training to local Kurdish groups. "They helped and trained us within the framework of the fight against (IS)," said Hussein Yazdanpana, a commander with the Iranian Kurdistan Freedom Party (PAK), who was quoted by AP. 28 year-old Maria Ahmadi, who joined the Iraqi Kurdish Peshmerga forces nearly two years ago, said in an interview with VOA that while she has received no training from American advisers, many of her Iranian Kurdish colleagues were part of a U.S. training program in northern Iraq. She currently fights in an all-female unit stationed near Kirkuk in northern Iraq. She too is from the Iranian Kurdish city of Mahabad, where many volunteers come from. With the knowledge of the region, and their shared ethnic background, Iranian Kurdish fighters have been effective in helping local Kurdish forces in Iraq and Syria in their fight on IS. Still, the presence of Iranian Kurdish fighters in Syria and Iraq may spike tensions as fighting continues between Iranian forces and Kurdish rebels in northwestern Iran. Along with other Iranian Kurdish rebel groups, PAK has been engaged with sporadic clashes with Iran’s Revolutionary Guards since mid-June in some areas along the Iran-Iraq border. “The involvement of the Iranian Kurds in the fight against IS in Iraq and Syria will definitely add to the complexity of their current multifaceted situation in Iran,” said Mort Anvari, a military consultant at the U.S. defense department. But Iranian Kurdish commander Yazdanpana said the Iranian Kurdish fight against IS "was never an alternative to their struggle" against the Iranian government. And Iranian Kurdish fighters say they believe they have Tehran’s blessing to fight for the Kurds against IS. 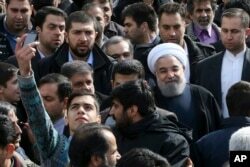 An Iranian man takes a selfie, hoping to capture Iranian President Hassan Rouhani in his picture during a rally marking the 37th anniversary of the Islamic revolution in Tehran on Feb. 11, 2016. The Iranian government allowed a public demonstration in Iran’s Kurdish region in support of the Kurdish fight against Syria as major battle loomed in Kobani in 2014. A Kurdish member of the Iranian parliament at the time called on Iranian Kurds to join the Kurdish fight. “There were some rumors that [Iranian] authorities encouraged young Iranian Kurds to join Kurdish fighters in the battlefields against (IS),” said Faryad Ilkhani, an Iranian Kurd, who fights with the YPG. Iran has recently become so public about its military involvement in Syria that it has been touting its alleged battlefield successes in state-run media, and allowing public burials of dead fighters. High-ranking Iranian officials in August participated in a memorial service for Amir Qobadi, an Iranian from Mashhad who they say was killed in a battle with IS militants in Syria. Iranian officials praised Qobadi as a brave fighter who lost his life, defending Zeinab Shrine, a holy site for Shi’ite Muslims in the southern suburbs of Damascus. The Iranian government's official line is that its fighters are in Syria protecting the shrine. But later, the YPG released a statement on Qobadi’s death, saying that Tehran “hijacked” Qobadi’s legacy for the its own benefit.